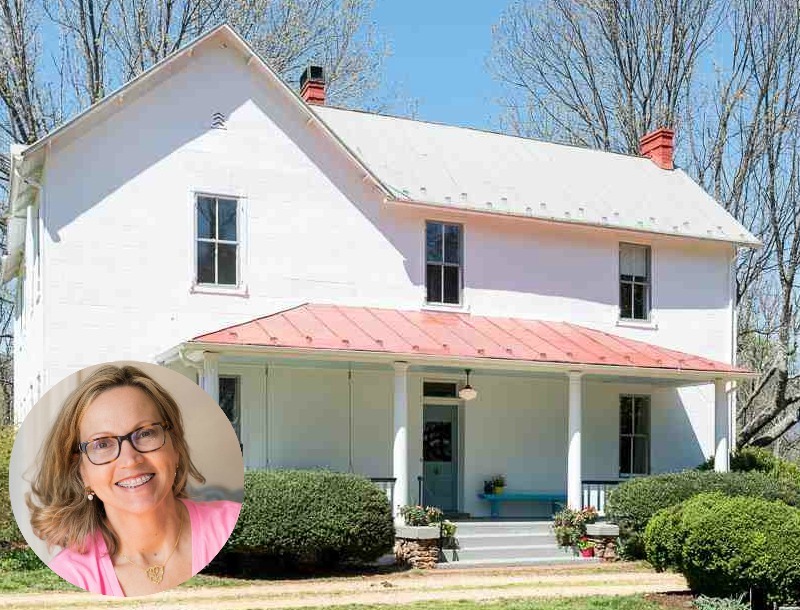 If you read the blog My Old Country House, then you probably have a crush on Lesli’s charming white farmhouse in Virginia like I do. 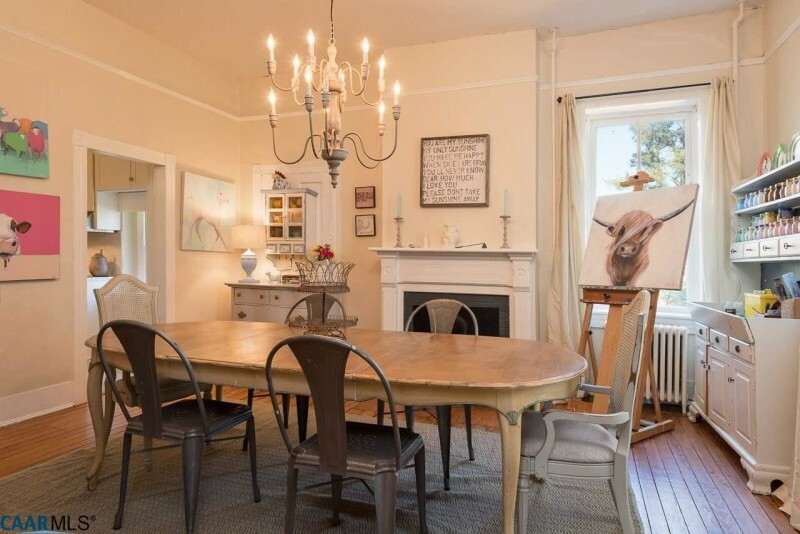 She put her artist’s heart and soul into fixing up the old place, so I was kind of shocked when she announced she was selling it. 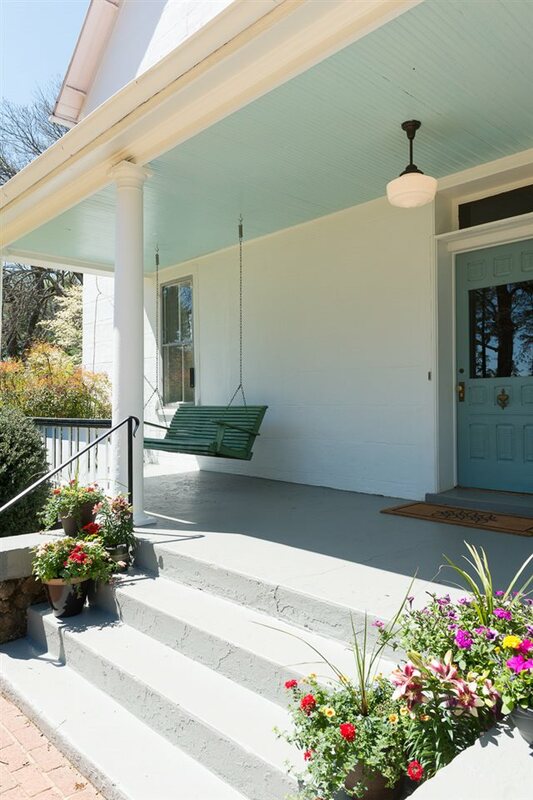 It just went on the market, so take a look and see if this might be your dream home, too. 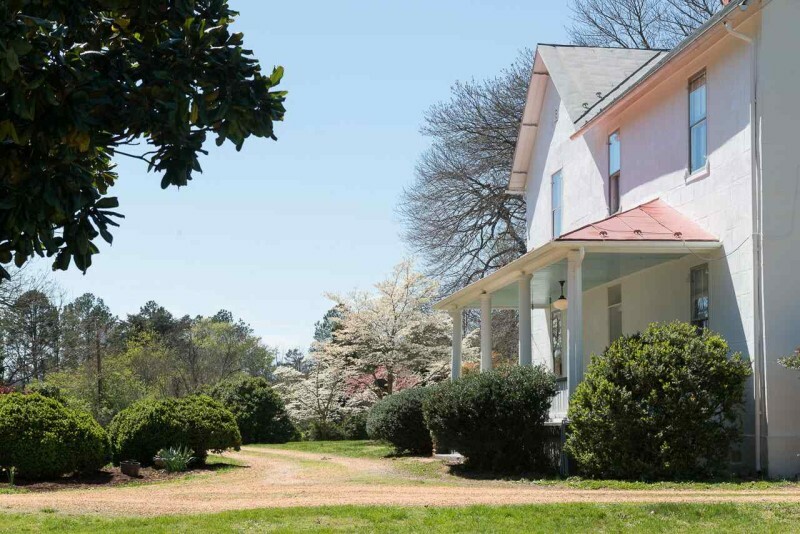 Lovingly restored 1880 farm house in the middle of historic Greenwood country estates. 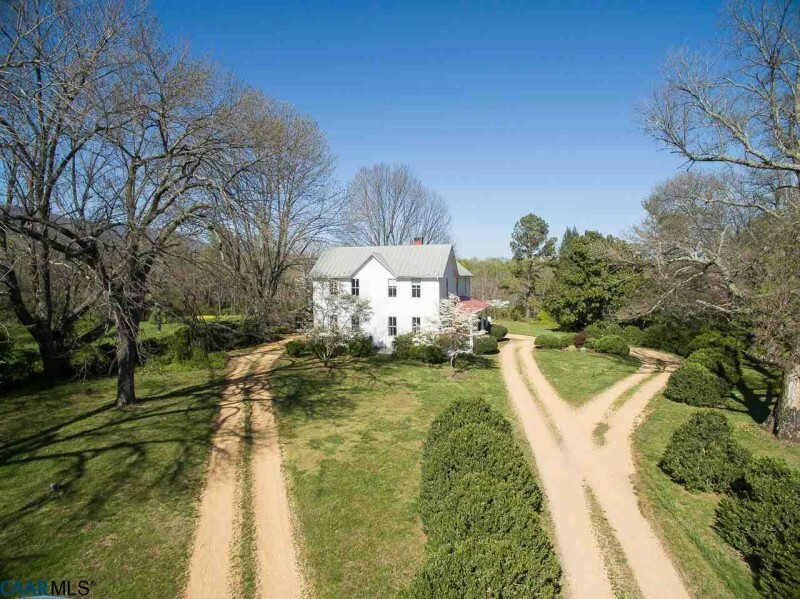 Exceptional location enjoys 2.34 acres w/ Blue Ridge & Ragged Mountain views surrounded on 3 sides by a large neighboring parcel under conservation easement. 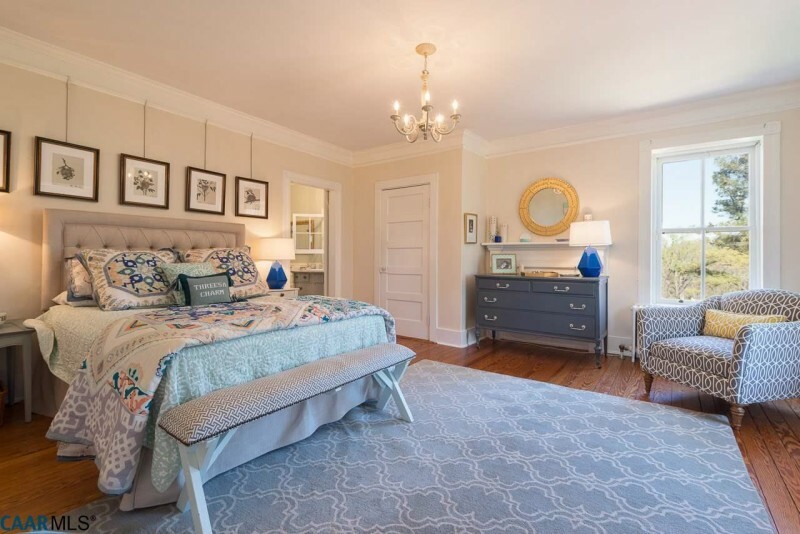 Extensive renovations & gorgeous decor has been featured in numerous national magazines including House Beautiful & Family Circle. 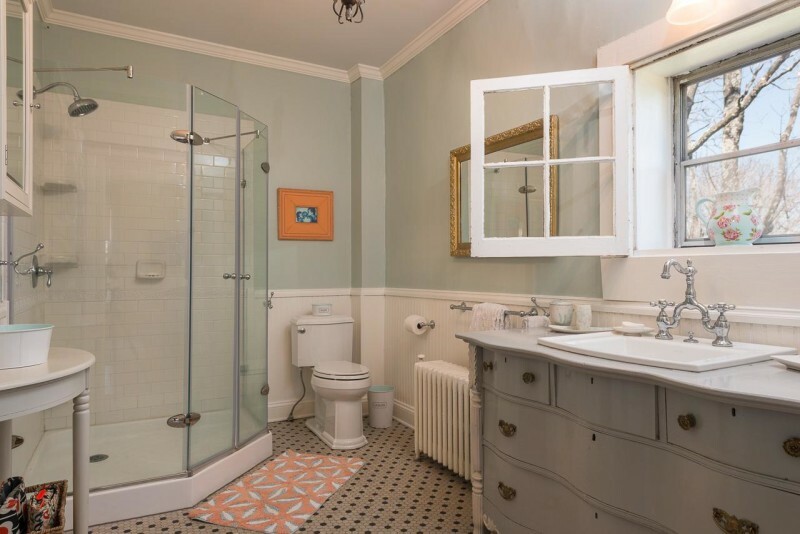 Timeless architectural details include: scored stucco exterior, metal roof, covered & enclosed porches, 10′ ceilings, refinished pine floors, leaded glass windows, picture rails & original sconces. 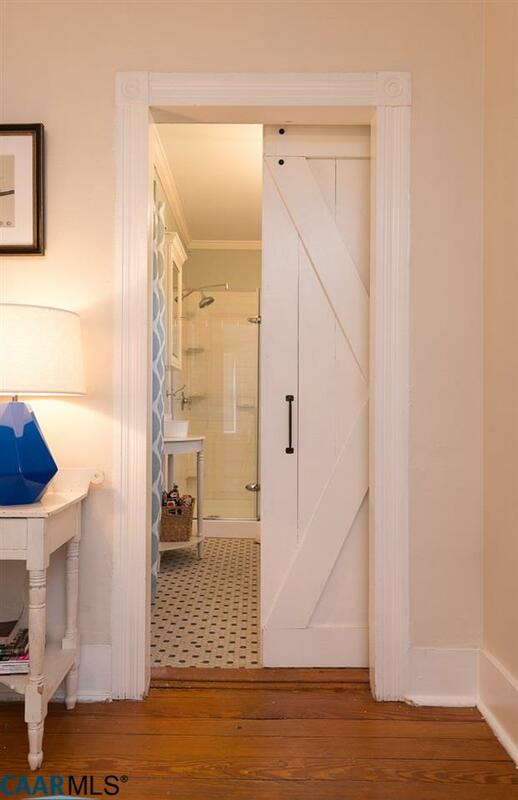 Gotta love these pocket doors! Lesli is a painter, and her love of color shows. 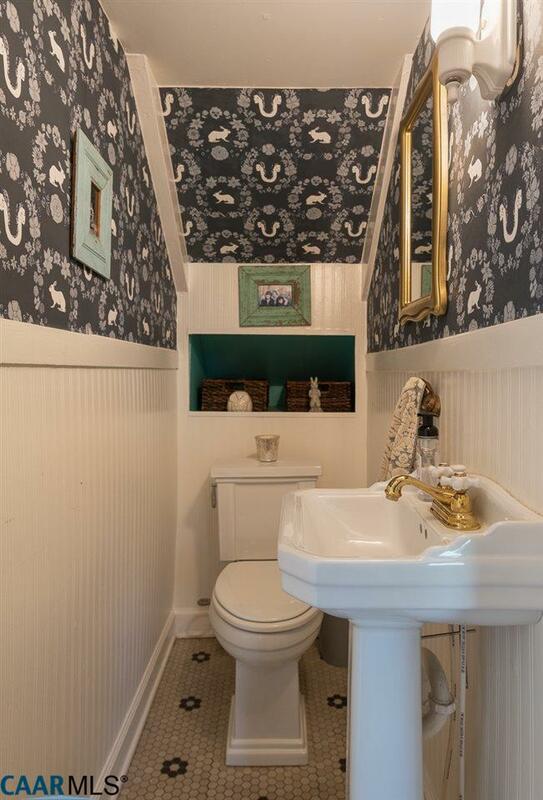 There was only one full bathroom when they moved in. They “carved out” another one for the kids. 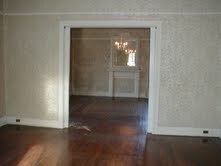 Look closely and you’ll see some of her paintings hanging in the rooms. They gave it a makeover on a budget by maintaining the original footprint and layout. Another cost saver? 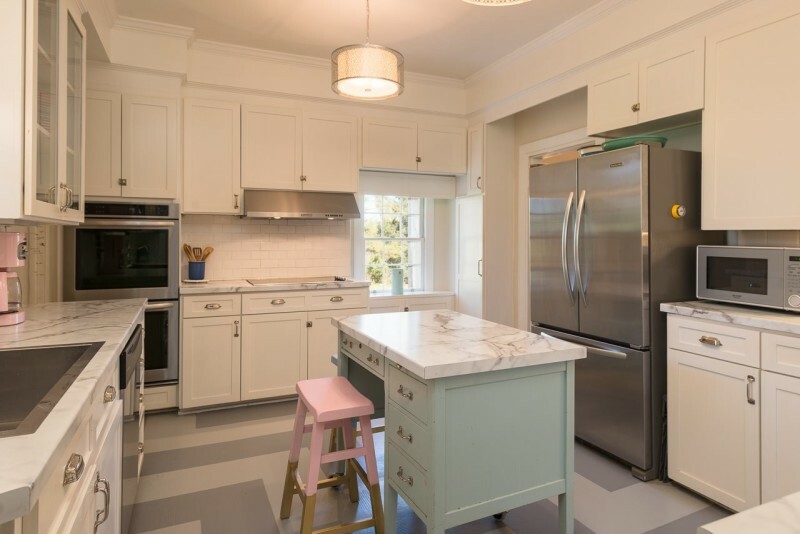 Those “marble countertops” are actually Formica! It was named Family Circle’s Budget Kitchen of the Year in 2013, for good reason. 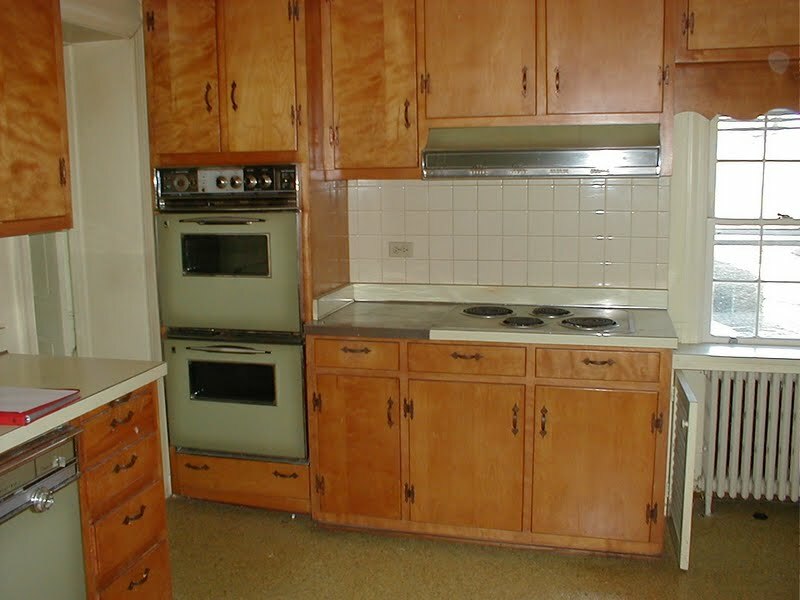 They kept the cabinets, replacing the doors and drawer fronts, and Lesli did most of the work herself. 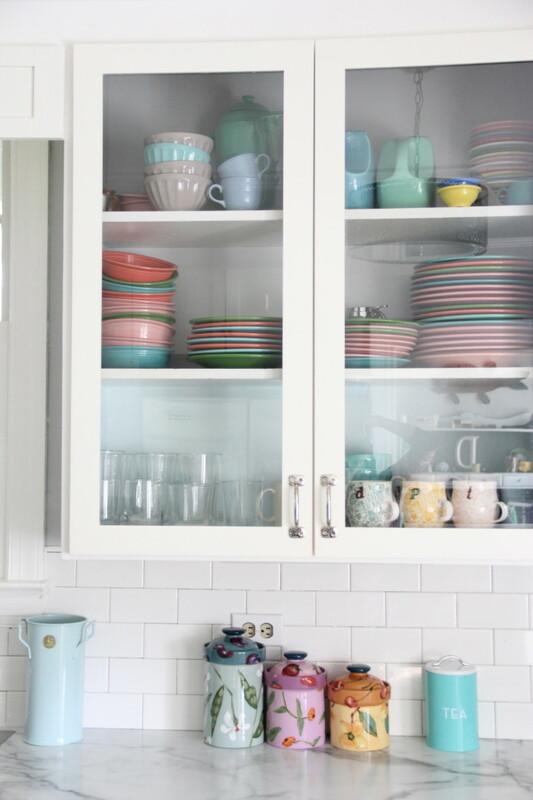 Visit her blog for sources and more details about the kitchen makeover. 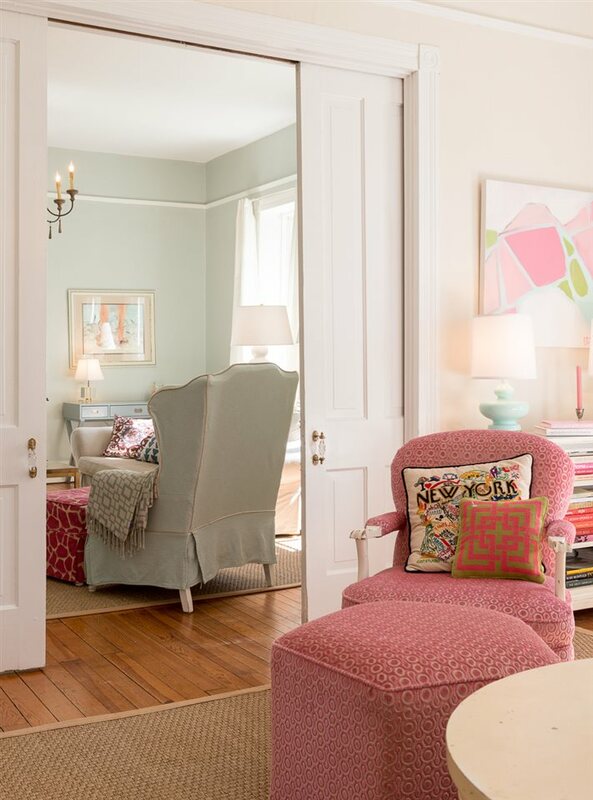 I have loved and worked on every inch of this house and I say that without exaggeration. I have raised my family in this house and I’m sending children off to college from this house. It is the most wonderful house I have ever lived in. But I do believe that the time is right for us to move to a smaller home. Though knowing so does not make much of this process much easier. 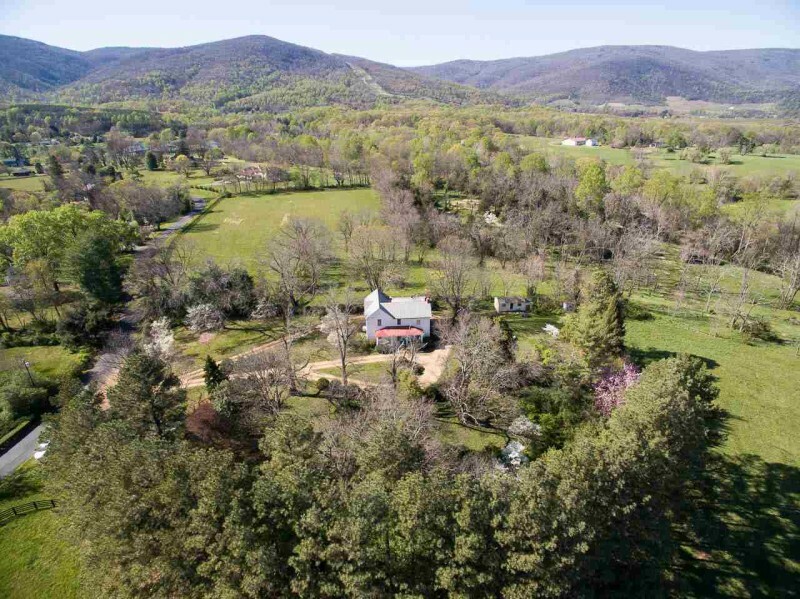 The farmhouse sits on over 2 acres in Greenwood, Virginia, with Blue Ridge Mountain views. Beautiful home! Must be so difficult to let a treasure like this go. I might decorate a bit less modern, but I love the renos they have done. The setting is incredible! 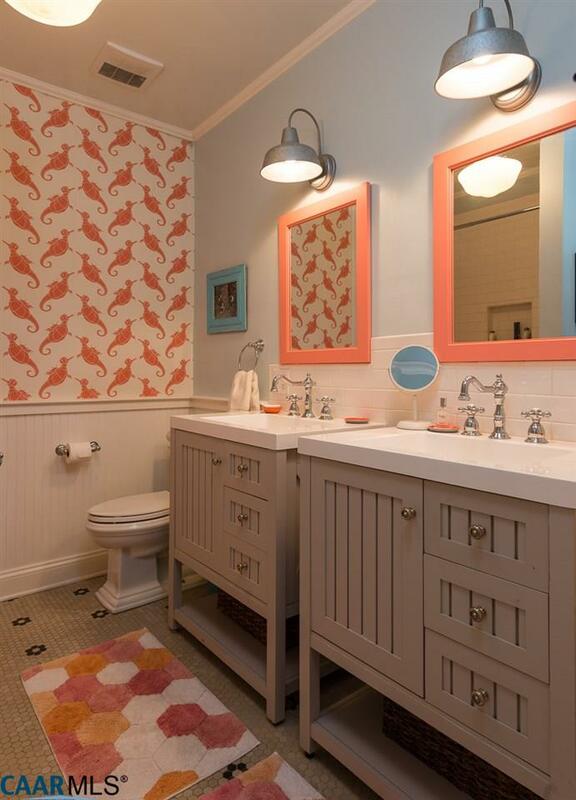 I love EVERY – SINGLE – THING – about this house! This is my perfect house!!!! And here I’m sending off my two from college and thinking what a perfect place this would be to spend these next years in. I paint also so I love her use of color…so happy! It’s all simply gorgeous! I’d move there in a heartbeat. 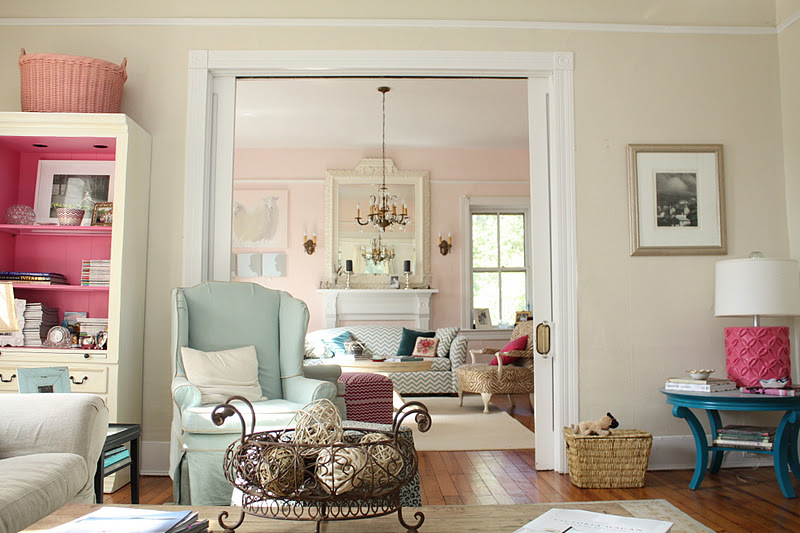 Love it all—the setting, the house, the colors, everything. BUT…. The real gist of this ‘complaint’ is the misuse of the English language! If you want to explain that you did your project on a small budget, then use the word “small” to define it…and actually giving at least a ballpark figure would be even better! 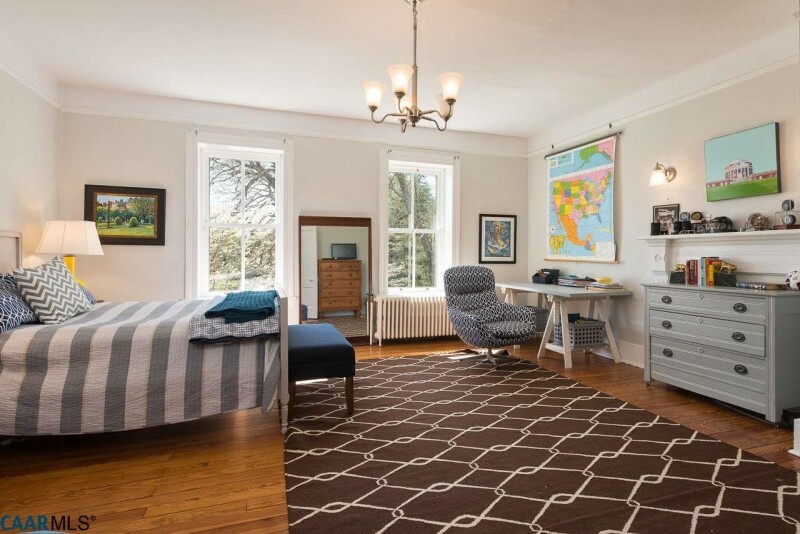 I would have liked it so much better without all the “cuteness” and pastel colors…This could have been so much more sophisticated…My favorite room is the child’s bedroom as the decor fits a child….all of the home looks child like…. She did a great job. But I never understand how a fireplace can be left blocked up. To me, it is the heart (and hearth) of the home, offering warmth, beauty and ambiance. It would be unthinkable to leave one blocked up and unused if it is already there. Most of the time, people close them up for pretty much no reason, and they work perfectly well. The one in my house hadn’t been used in over 20 years and the former owners didn’t even know whether it worked (and never tried to check!) After about 20 minutes with a good chimney sweep, she was ready to go! I agree; a wood burning fireplace is lovely if it works. If it doesn’t, and more work is required than just a sweep, the costs can run into the thousands, which not everyone wants to invest. Also, some people just feel that where there’s fire, there’s risk. I know a lot of people who have lost everything to fires. Perhaps taking on this responsibility is not something everyone wants either. This is stunning! It looks like love was raised up in that home! 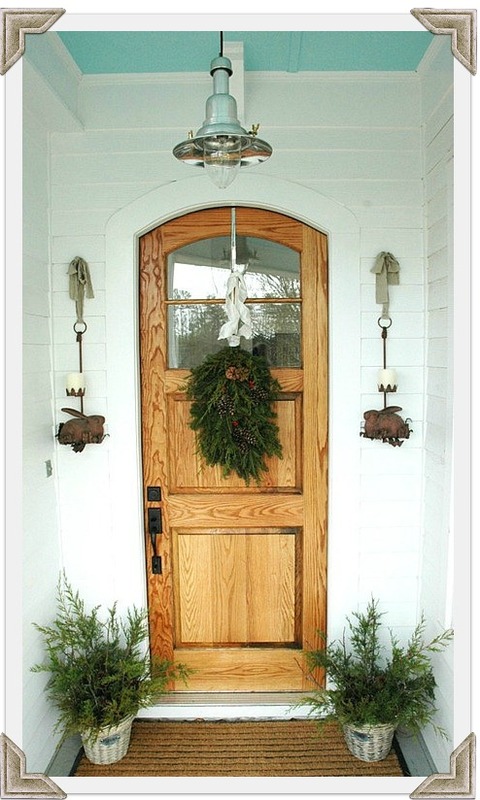 I would LOVVVVVVE to know the color of the front door! ?????? What a loved and lovely home! And such a beautiful setting. Hope you have a relaxing and enjoyable vacation, Julia. And kudos to you for writing a novel! I know you are probably overwhelmed with social media, but have you ever looked at the bookstagram community on Instagram? Fun, kind, and supportive and full of tidbits on interesting books. I’m reading a novel now of someone I follow on Instagram, a writer whom I had read and enjoyed, and she graciously follows me back and remarks on my comments. I’m not on FB, but I do enjoy Instagram. 875K??? Around here a 3/2 on 2 acres without all the bells and whistles (no granite or marble, painted linoleum floors, etc) would go for about 250K. Greenwood must be a mighty big real estate market. 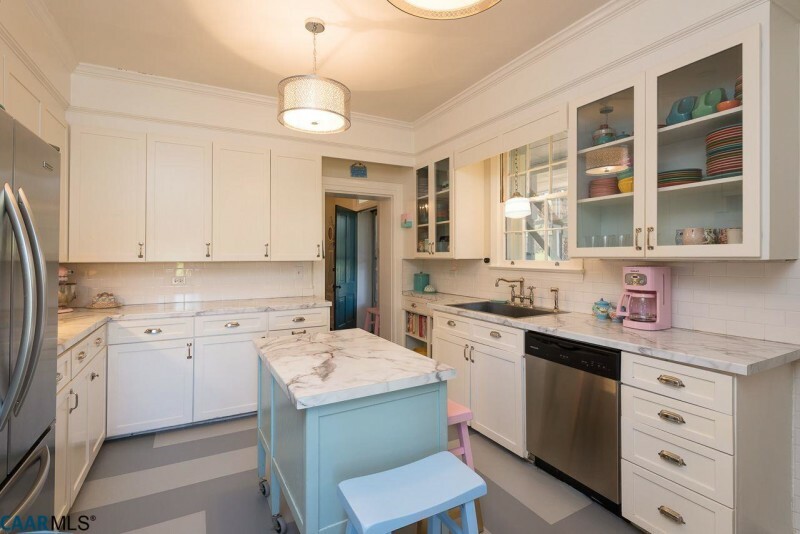 I was so envious of the pretty marble counter tops-then I read they were Formica! Wow they look great! What a lovely place! It’s so full of natural light, which I love in a house. 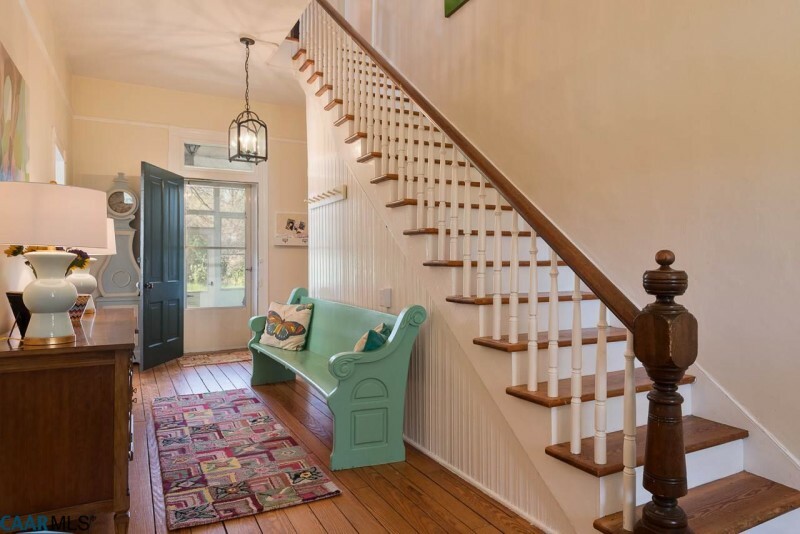 I really like that bench in the foyer. It has such nice curves, which I’m drawn to. Hi Julia, this is an absolutely beautiful house. 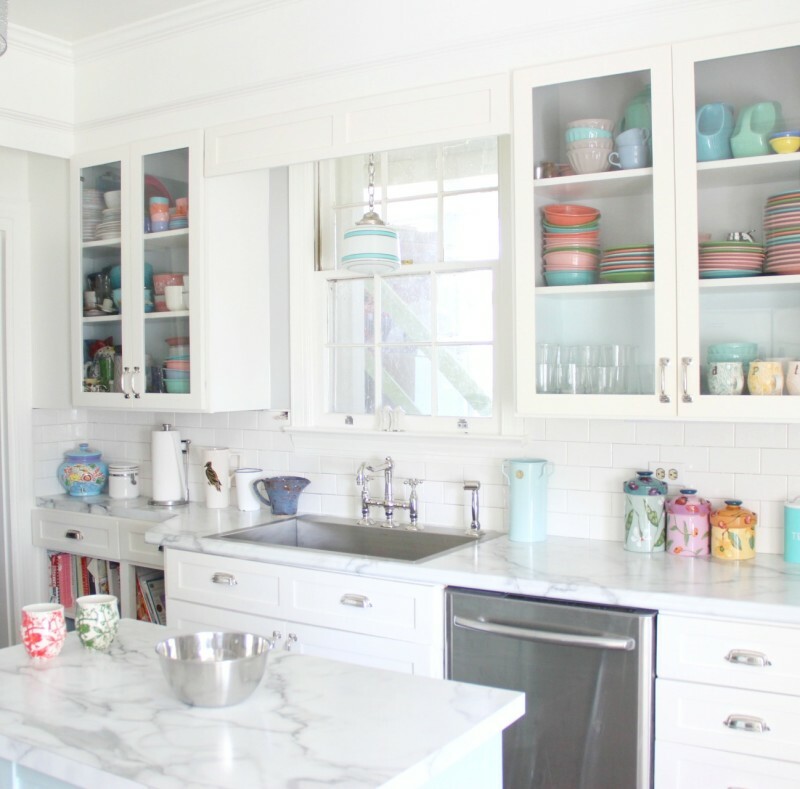 I am so in love with those kitchen bench tops. 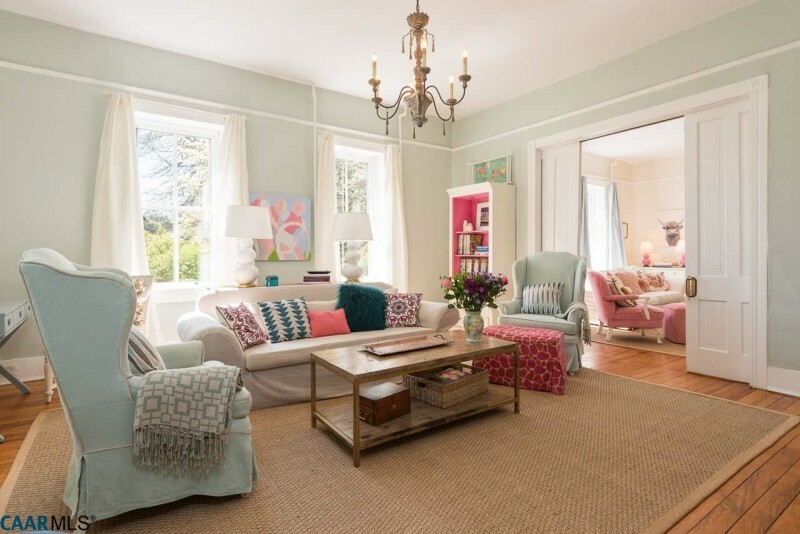 Love the colors inside the home, wonderful lively decor . 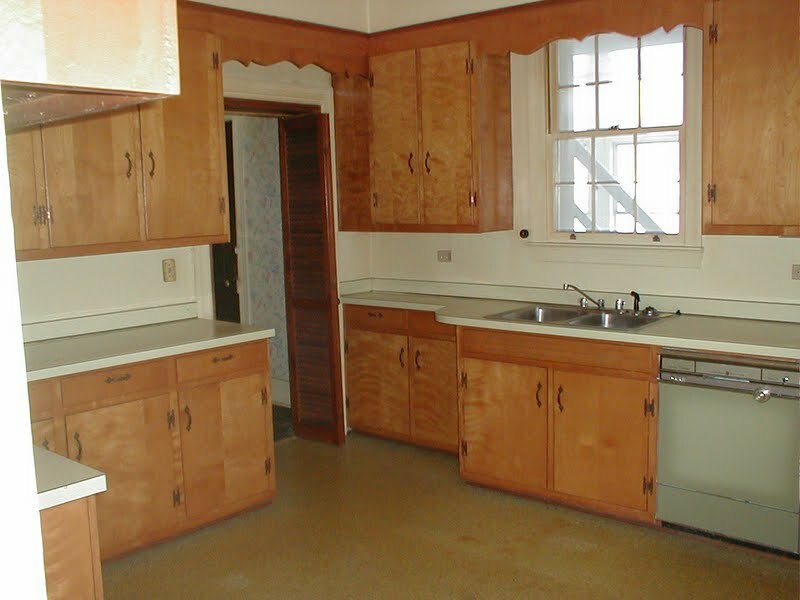 The formica counter tops are beautiful and seems like more people are opting for them again over the granite. After seeing these , I can understand why. This grand old lady only lacks one thing…….me! Thank you again Julia for featuring my Old Country House and Thank you to everyone for your thoughtful comments. 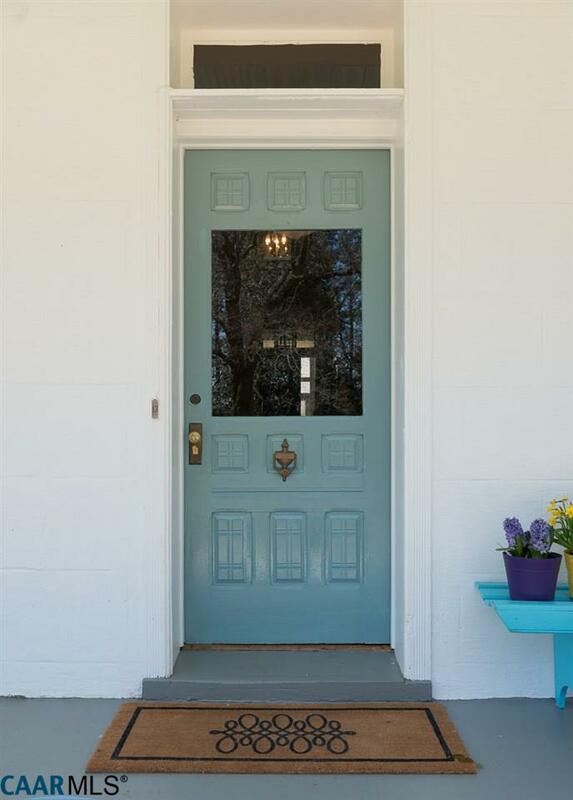 The paint color of the front door is a Benjamin Moore ‘Williamsburg” color called “Apollo Blue”. 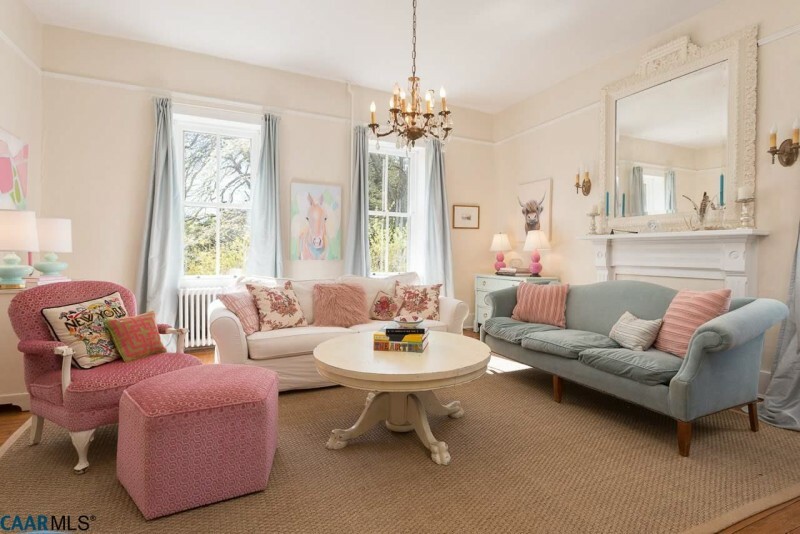 Lesli, your home is BEAUTIFUL! Thanks for sharing it with us! 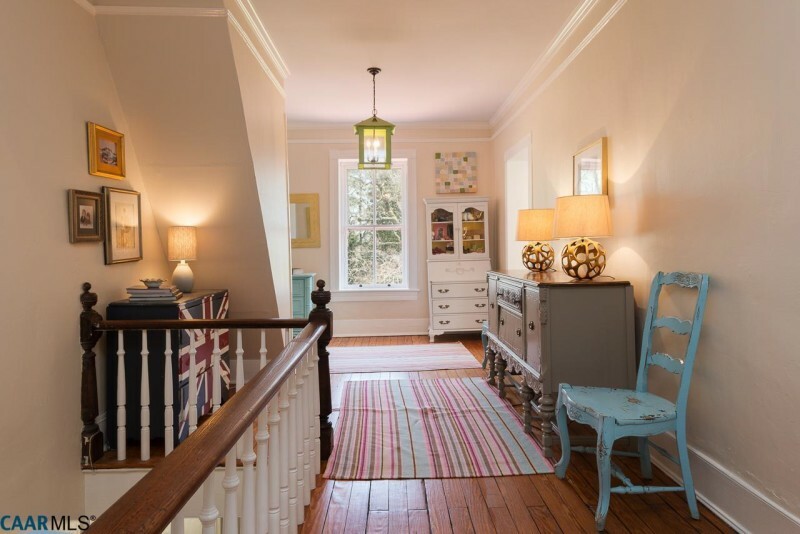 Question – could you tell me where you purchased that fabulous pendant in your foyer? 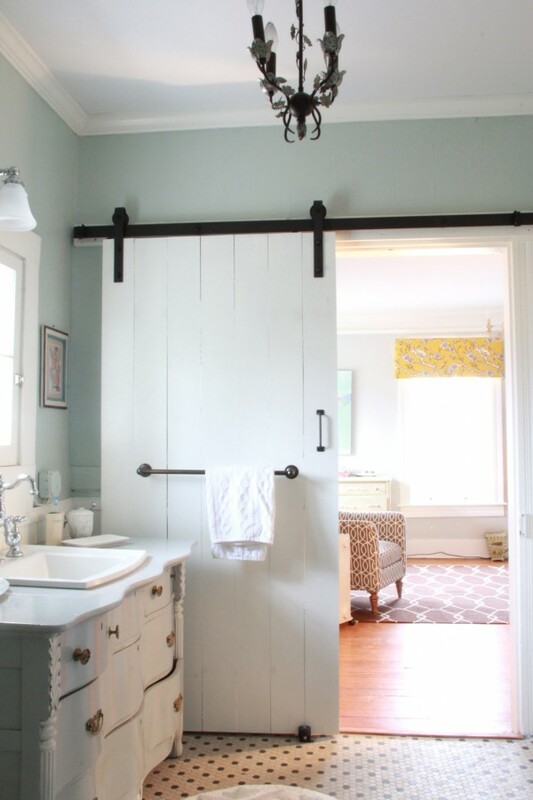 I’d love something like that for our new house. Thanks! Thank you! The pendants in the foyer are from Ballard Designs. The upstairs pendants are from Shades of Light. Loved the house. 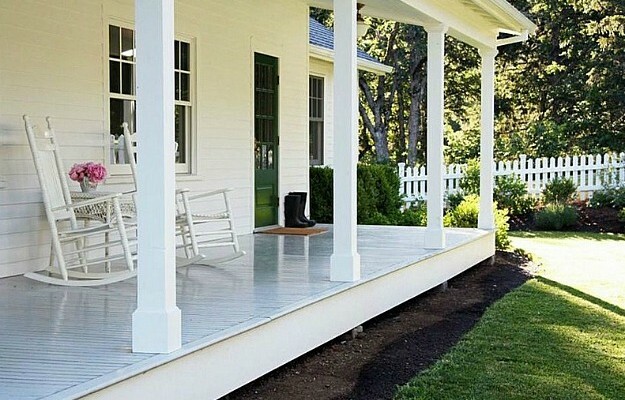 Can you provide the color of the porch ceiling?